Spanning 39 primarily first-level subnational political and administrative divisions (e.g., province, state, etc.) in 12 tropical countries, The State of Jurisdictional Sustainability is an comprehensive report which looks at early lessons learned from jurisdictional approaches. These approaches hold tremendous potential for advancing holistic solutions to a number of intersecting issues, including tropical deforestation, rural livelihoods and food security. The report evaluates progress towards sustainable development, including goals and commitments, monitoring and reporting systems, multi-stakeholder governance platforms and innovative policies and initiatives that are core elements of jurisdictional sustainability. The assessment also includes in-depth analysis of deforestation and emissions and explores barriers to and opportunities for jurisdictional sustainability. 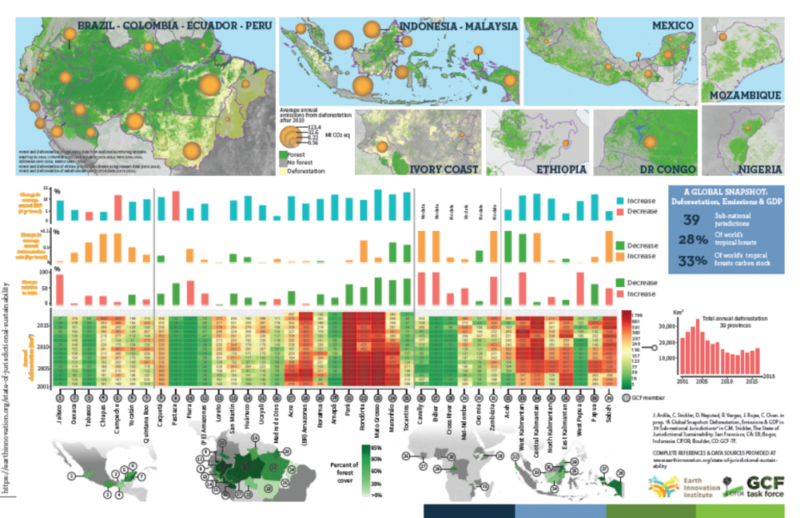 The State of Jurisdictional Sustainability is a collaboration between Earth Innovation Institute (EII), the Center for International Forestry Research (CIFOR), and the Governors’ Climate and Forests Task Force (GCF-TF). The full report can be downloaded here.